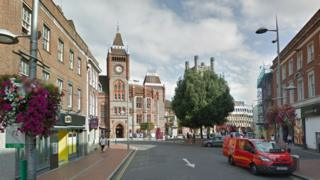 The death of a man who was punched in the street is no longer being treated as murder, police have said. The 48-year-old victim died in hospital after hitting his head on the ground, police said. An 18-year-old man from Crowthorne has been bailed until 10 May while police pursue a manslaughter investigation. Previously the teenager was arrested on suspicion of murder. Det Insp Sally Spencer said: "I want to reassure the community that this was an isolated incident between two people who were known to each other. "I want to take this opportunity to appeal to any witnesses or anyone with information to please come forward. "The town was busy on Friday night so I am sure there are some people who are witnesses but were perhaps unaware of the seriousness of the situation."